The early twentieth century was a period of rapid urbanisation, with folks flooding into urban centres, including Edmonton, from the country, and building the city up around them as they came. Some urban planning came with this influx, including plans for moving citizens around the city. For example, the City of London Pedway Scheme in London, England, had its beginnings in the late nineteenth century, and early pedestrian tunnels were built in Toronto beginning in 1900. In cities like these and like Edmonton, though, the speed of this urban migration meant that there were often few resources left for much planning as new citizens were settled as quickly as possible. Further, the economic boom of this period was quickly followed by a bust that, in cities like Edmonton especially, wouldn’t be fully resolved until after the Second World War. The postwar period saw economic expansion that lasted until the 1970s. While urban migration had slowed down, and was in fact largely replaced by the birth of suburbia, now was the time for the planning that had been missed in the prewar urban boom period. While time and other resources were important means for carrying out these plans, the birth and growth of suburbia, and the commuter culture that came with this, provided significant impetus. How, planners wondered, could urban centres be made more usable and palatable to the white-collar workers who resided in suburbs but used cities throughout the workday? As the middle class continued to rise, there was great concern surrounding the idea of these white-collar commuters interacting with folks on the street as each group went about their business in heavily urbanised downtown centres. With the implementation of a pedway system, commuters could be sheltered both from the elements and from those deemed down on their luck or otherwise “undesirable”. As the postwar period continued, this plan was welcomed in Edmonton. However, things haven’t always gone smoothly. Edmontonians truly have a love-hate relationship with our pedway system. We wish that things had been done differently from the get-go, that ongoing development had been more thoughtful, and that the actual implementation of the pedway looked as lovely as our dreams of it. As we continue, though, perhaps some of these dreams can be improved upon. By 1968, a pedway plan was approved by the city. It is important to note, though, that this plan was never a unified one—clarity never seems to have been reached regarding exactly what our pedway would look like or encompass. Much of the actual work done on the pedways came along with the 1970s building boom, and the first pedway connections in Edmonton opened as part of Edmonton Centre in 1974, connecting it with the 14-level parkade across 102A Avenue. The boom continued, and between 1974 and 1989, the city invested over $65 million in pedway and LRT expansions. This massive construction project was not without its downsides. Throughout the 1980s, the projects caused major economic harm to the businesses on Jasper Avenue—some say even more so than the opening of West Edmonton Mall. Many have argued that this harm had a far-reaching effect on the general milieu of downtown Edmonton. Between 1981 and 1990, the boom went bust again. More than 11,000 provincial employees were laid off, many of whom worked in downtown offices, as were a substantial number of corporate workers. With the raison d’etre of the pedways rapidly disappearing, so did funding. During this period, pedway development ceased. Further, many of the businesses that lined the pedways closed down, meaning that portions were closed off. Dead ends began to emerge in the system, as did partially completed chunks like the one in the Stanley A. Milner Library parkade. Some construction gradually began again, and by 1990, many considered the pedway system to be complete, after two major projects were finished: these were the extension of the LRT to Grandin station, which linked the downtown pedway system with the Legislature pedway; and the pedway linking Edmonton Centre with Churchill Station. Downtown Parking and Pedway Map c. 1991, created by the City of Edmonton Planning Department. Original available at the City of Edmonton Archives Pedway Clippings File. Do not reproduce. Downtown Parking and Pedway Map c. 1996. Map reproduced with the permission of the Downtown Business Association. Original available at the City of Edmonton Archives Pedway Clippings File. Do not reproduce. Despite the downturn in pedway construction, many Edmontonians still saw the system as a generally good one throughout this period. The reasons discussed above remained: those using the pedway didn’t want to come in contact with people on the street, they were glad to be out of the weather, and they generally felt safer. Unfortunately, a few incidents directly contradicted these feelings of safety: in 1988, a woman was killed in a washroom at the Churchill LRT station, which is part of the pedway system. And in 1990, a woman was slashed with a knife at the pedway entrance to Scotia Place on Rice Howard Way. Unsurprisingly, some public unease followed these attacks. By the early 2000s, Edmontonians’ opinions of the pedway had largely shifted toward the negative. Contempt for the system and hope for its closure were common themes. 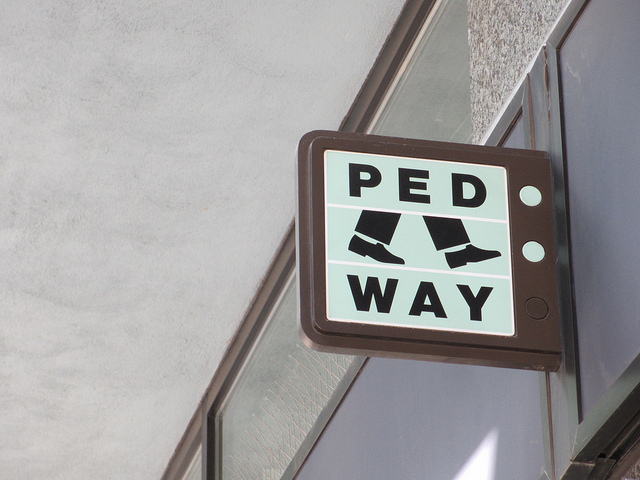 Not only were there questions about the safety of pedways, but many felt angry that the system never had a unified plan, a reliable mapping system, or a consistent aesthetic. Indeed, there were questions about whether stretches of the system had an aesthetic at all. In 2010, Downtown Business Association Executive Director Jim Taylor remarked that the pedway from Enterprise Square to 104th Street was “one of the bleakest, most sterile environments you could imagine”. Further, the lack of unified plan means that the pedway is currently covered by more than 30 agreements with private and public entities, some of which have remained the same for decades. Some directional signs didn’t change (although the directions did change) from the 1970s through 2014. In 2010 Taylor claimed that there was no one entity in charge of the system, making it impossible to change signage. While LRT expansion was seen as vital to continuing development downtown, the pedways were understood to work against it. Despite the recent sentiments against it, Edmonton’s pedway system remains. The current downtown pedway network is 13 km long, and connects 40 buildings, 3 LRT stations, and hundreds of stores. Recent construction booms mean that the pedway is likely to continue to grow, with the development of the Arena District and other construction projects expected to add up to 40% more pedways. Edmontonians, though, seem determined to learn from their urban design mistakes of the past. Many stretches of the system are now marked by a wide variety of public art pieces, showing a real commitment to improving aesthetics. While Fred Kent, President of the New York City-based Project for Public Spaces and ardent pedway opponent, has called pedways an effort to “engineer winter out of existence” (sometimes a tempting prospect in Edmonton), plans for pedway expansion include ideas like a winter garden over 104th Avenue. It’s difficult to say what Edmonton’s pedway system will ultimately look like—and whether it will continue to exist at all. In an effort to solve perceived and actual problems in our downtown core, it has also created a seeming multitude of other problems. By learning from past problems, though, perhaps Edmontonians can build a bright future for our pedways.